🎓 The church is facing an epidemic of biblical proportion; The practice of gossip. It is not surprising then, that God names the practice of gossip as a sin that He hates. This teaching will expose the reasons we gossip and how we can stop it. 🎓 Do you know of someone who is struggling with anger? Perhaps you are the one struggling. The bible has much to say on the subject of anger. 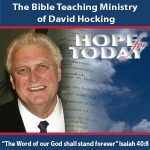 Presented by renowned bible teacher, Dr. David Hocking, four areas are addressed: Why do we get anger? When is it right to be angry? When is it wrong to be angry? How can we control our anger?